My beloved yoga teacher has not been well. She is on a strict renal diet. For all the she has done for me and be there for me through the years, the least that I can do is to do some cooking for her. I know she loves to eat, I have been experimenting and creating different dishes that are low in potassium and phosphorus. I am very surprised how limited the diet can be and how fun it is to come up with ideal to replace one for another. I didn't post any recipe, however if you are interested in any of these dishes , please let me know and I will sent you the recipe. Momi like Korean food. 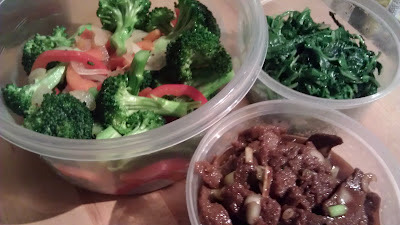 I made a simple stir fried mix vegetable and a mock-beef strips cooked in shoyu and mirin sauce. I separated the 2 elements to make reheating simpler. The small green container is not spinach. It is a renal friendly version of the classic Korean spinach or watercress side dish. I lightly sautéed some arugula, toss with the classic Korea seasoning of shoyu, pepper and a splash of sesame oil. Summer is finally here, I noticed that Momi pinned a quinoa salad recipe on her Pinterest. 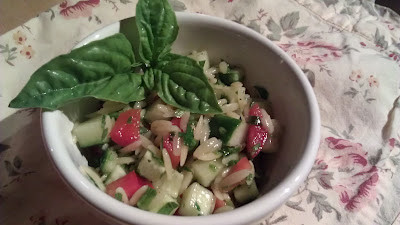 I wanted to create something similar by using orzo as the "grain", replace the tomatoes with red pepper and elevate the taste by combining basil and Italian parsley in a light vinaigrette. 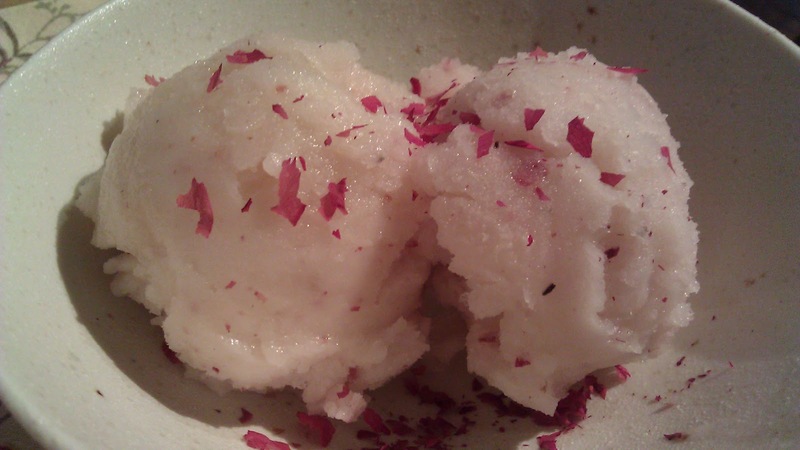 Another version of pudding. This time with rice milk and tapioca. 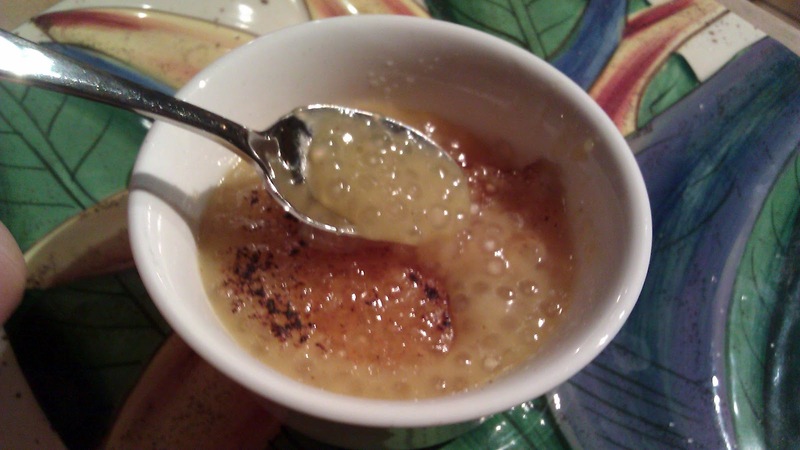 The rice milk lack texture and the tapioca does not bring much richness, so I added eggs to give the pudding the richness. Momi is vegetarian, this is a very simple noodle salad with julienned carrot, celery, green onion and Asian 5-spice tofu for protein. The dressing is a simple vinaigrette with a splash of sesame oil. I usually would make this dish with a peanut dressing, but nuts is off limit for her. 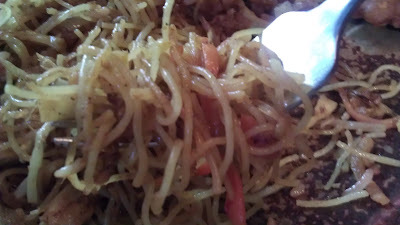 You will actually find this recipe here, it is just my fried rice with vegetable topping. I added an extra egg in the rice to make sure she had enough protein in her diet. 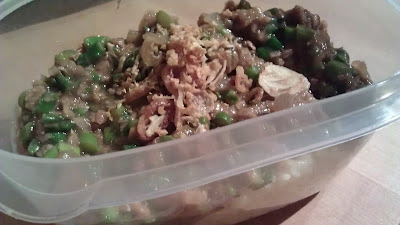 The vegetable topping here is a mixture of chopped asparagus, cabbage and soy crumble. (Rinvented Old Fashion Chinese "Vegetable Rice"
This is the 1st recipe I experimented with. I replaced the milk with rice milk. It is a much lighter version. 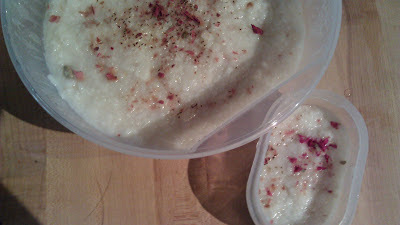 but still have all the flavor and bold taste of a classic kheer.